So, let's start with the reading: I'm actually working on an unheard of TWO non-fiction books right now. Listening to As You Wish, by Cary Elwes, and so far it's as great as one might imagine it to be. A memoir about the making of everyone's favorite modern fairy tale, read in audio book format by Cary and a few of his Princess Bride compatriots. It's making dish-washing much more entertaining. The second book I'm reading is called the 10 Habits of a Happy Mom, by Meg Meeker. Nothing earth shattering here, but it has some good reminders and solid practical advice. (and it's not as hokey as the title sounds, I promise). Now on to the rant: Daylight Savings Time ends this weekend. I can rant for DAYS on why I hate DST. Not that it ends this weekend, no...I hate that we move to DST in the spring. First of all, the innacuracy kills me. IT DOESN'T "SAVE" DAYLIGHT. IT JUST SHIFTS IT AROUND. There is a finite number of daylight hours each day of the year. That never changes. Which is why I currently get up in the pitch black, even when it's 7 a.m. All DST does is make our sleep and energy levels wonky for two weeks out of the year. And yes, I know that a lot of people like having more time after work/school to do things outside, but is it really worth it? Ask the people in Arizona and half of Indiana what they think. Oh, and the rest of the world. Honestly, I'd be happy to just change the time permanently and be done with it. Or leave it. Either way, the flip flopping drives me batty (as if the excessive caps weren't your first clue). And for randomness...I got nothing. Except an infant, which is as random as it gets. If you enjoy memoirs with a light, quirky, funny voice, you'll probably enjoy this book. If you've ever found yourself with a less-than-mainstream interest, you'll probably enjoy this book. If you've ever found yourself a bit of an outsider, or if it took you a while to find your tribe, you'll probably enjoy this book. If you like anything "geeky" -- video games, board games, fantasy fiction, science fiction, comic books, etc. 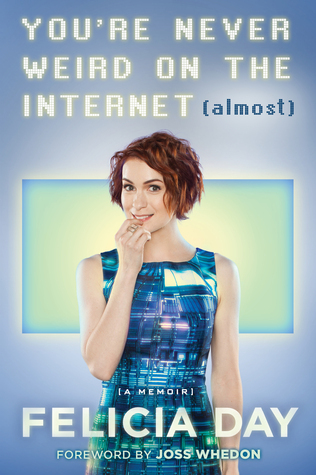 -- then you probably already know who Felicia Day is and you've already read this book. If not...you'll definitely like You're Never Weird on the Internet (almost). I thoroughly enjoyed Day's book. I laughed out loud basically at least once a chapter. And while it's certainly wry and witty and funny, Day touches on a few more serious subjects such as her run-in with some of the appalling people of "gamergate" and her near-mental breakdown. But she does so with the light touch with which she writes the whole book. It's light without being frothy, down-to-earth, and like reading a letter from a good friend. oh, but I do have to say...not ALL homeschoolers (myself included) had her particular brand of kind-of-crazy-and-not-at-all-well-rounded homeschooling. Many of us had/have pretty standard educations.